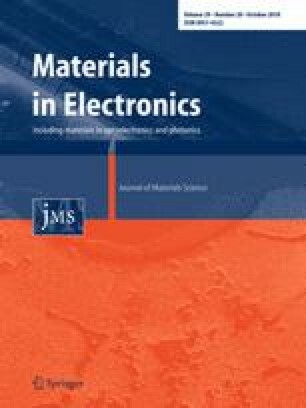 This paper discusses the results for heterojunction solar cells based on three components (with fullerene acceptor), which are based on the pyrazoloquinoline derivative. Photovoltaic devices based on ternary systems are presented along with a model optimization for such mixtures. The device bulk-heterojunction type cells represent architecture ITO/PEDOT:PSS/organic active layer/aluminum in various configurations of the active layers. The authors have analyzed the current–voltage characteristics of photovoltaic cells and determined the parameters. The constant increase in electric demand, resulting from advancements in technology and a rapid growth in population, has contributed to higher demands for energy. With the ever-growing importance of protecting the natural environment, renewable energy sources, including photovoltaic cells, have become increasingly popular [1, 2]. So far, three generations of photovoltaic cells have been developed: silicon , so-called semiconductor thin-layer cells [4, 5] and the third generation, consisting of dyes [6, 7], organic cells [8, 9], polymers and perovskites [10, 11] cells. One of the current research trends in organic solar cells is to use a ternary mixture as active layers in bulk heterojunction solar cells . A typical active layer is produced by blending conjugated polymers (donor) with high electron affinity molecules (acceptor), like fullerene derivatives. In principle we can consider two types of ternary solar cells—Donor 1: Donor 2: Acceptor and Donor: Acceptor 1: Acceptor 2 [13, 14]. The publication concerns the active layer with two donors and one acceptor. The motivation behind creating ternary systems is, above all, a relatively low, narrow spectral overlap of organic polymer absorption. Nanoparticles [15, 16], polymers [17, 18] and small molecule compounds  are developed as additives. The studied compounds are suitable potential candidates for optoelectronic application in general and particularly for ternary solar cells [20, 21, 22, 23]. The mixture is comprised of the following: [phenyl-C71-butyric acid methyl ester (PCBM)] as the acceptor; poly(3-hexylthiophene-2,5-diyl) (P3HT), provided by Sigma-Aldrich, as Donor1 (Fig. 1); methoxyphenyl indenopyrazoloquinoline derivatives (synthesized) have been applied as additives for Donor 2. They can be considered as two-dimensionally extended, polycyclic heteroaromatic molecules, called nanographenes, which can play a key role as functional chromophores and organic semiconductors . The compounds 1a–c were synthesized in a three-step procedure. Firstly, commercially available β-ketoester was heated with methylhydrazine in boiling ethanol. Next, the obtained pyrazolone, o-bromobenzaldehyde, and aromatic amines were heated to reflux in ethylene glycol. Lastly, halo-pyrazolo[3,4-b]quinolines 1a-c, the right precursors by means of palladium coupling reactions were converted into indenopyrazoloquinoline (azafluoranthene) derivatives  (Fig. 2). The methoxyphenyl indenopyrazoloquinoline derivatives have been previously investigated and accepted as promising compounds for organic light emitting diodes . Photovoltaic substances require certain properties to be used in cells. The solar cells material properties are complementary to those required in diodes. Methoxyphenyl indenopyrazoloquinolines are characterized by a broad absorption spectrum, luminescence, as well as thermal and photochemical stability. The compounds designated as MPTM-IPQ1, MPTM-IPQ2, MPTM-IPQ3 have almost identical broad absorption spectrums of 250–450 nm, with two maxima and a luminescence spectrum maximum of 550 nm. HOMO LUMO levels were determined by cyclic voltammetry as follows: MPTM-IPQ1: HOMO level − 5.91 eV LUMO level − 3.18 eV; MPTM-IPQ2 HOMO level − 5.91 eV LUMO level − 3.21 eV, MPTM-IPQ3: HOMO level − 5.88 eV LUMO level − 3.17 eV. The primary motivation for adding another component was to widen the absorption spectrum. P3HT has a maximum at about 450 nm, and it was desired to include the UV part of the solar spectrum. As presented in Fig. 3, when two donors are used, a wide band from 250 nm to 550 nm is covered. Other reasons to add MPTM-IPQ substances are the well-coordinated HOMO and LUMO levels of the three involved compounds. The triple system, due to the proximity of the energy levels, as well as the possibility of cascading the charge transport , seems promising. Due to the low ability to charge transport, well transportable fullerene compounds (in our case PCBM, with the carrier mobility of 0.21 cm2/Vs) are required. The mixing of substances has been shown to be an attractive way for controlling the morphology of the active layers. The first problem encountered was to find an appropriate Donor 1: Donor 2 weight ratio. The optimization of the weight ratio of the two donors according to the algorithm has been precisely described in Felekidis . The normalized absorption was calculated for different concentrations and thicknesses from 70 nm to 140 nm for P3HT and MPTM-IPQ1, MPTM-IPQ2, MPTM-IPQ3 combinations. Due to the fixed density of the mixtures, at different application rates, the selected configurations are possible to be obtained experimentally. Results are presented in Fig. 4. Figure 4 lead us to two conclusions—the methoxyphenyl indenopyrazoloquinoline derivatives do not improve performance and cells should be prepared using the thinnest layers as possible. Furthermore, differences between sequels are minimal. It should be noted that this model only considers the optical properties of the compounds. Bulk heterojunction ternary photovoltaic cells based on ITO/PEDOT: PSS/active layer/Al architecture have been prepared. The PEDOT: PSS [(3,4-ethylenedioxythiophene) polystyrene sulfonate] layer (about 60 nm in thickness) and the active layer were spin-coated on a cleaned ITO/glass substrate in an argon atmosphere and then heated in a vacuum. The aluminum contact was evaporated. The Donors–Acceptors weight ratio used in these cells was 1:1. The current–voltage characteristics were studied and the cell parameters (short current density Isc, open circuit voltage Voc, fill factor FF, efficiency) were calculated based on these characteristics. The results are presented in Table 1 and Fig. 5. Due to the similar absorption spectrum and the optical properties, the decisive factor in cell performance there is electrical conductivity. 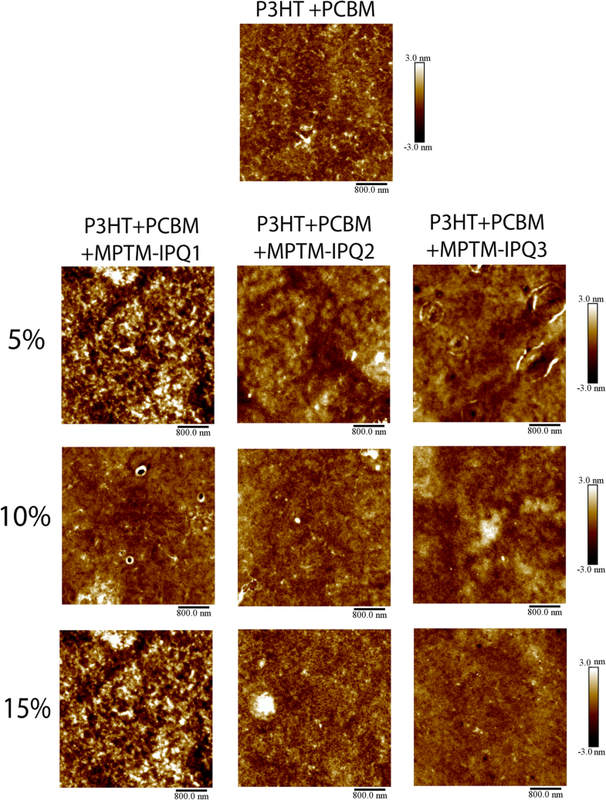 The best efficiency was obtained for compound MPTM-IPQ2 with its HOMO energy level being nearest to PCBM; the second is MPTM-IPQ3 and the last—MPTM-IPQ1. Lower values of short-circuit current were caused by the poor conductivity of small molecules. The transport along the polymer and fullerene system was undisturbed. This rule does not exclude the cascade charge transport, but it surpasses it. It is possible to consider donors mixture excitation. The HOMO/LUMO energy offset should be equal to or larger than the binding energy of singlet and triplet excitons . The best performance of the MPTM-IPQ2 compound can also be justified by the maximum LUMO energy offset noted by this substance. LUMO energy offsets achieved for compounds a MPTM-IPQ1, MPTM-IPQ2 MPTM-IPQ3 are 0.18 eV, 0.21 eV, 0.17 eV, respectively. This energy levels system determine the optimal photocurrent of dissociation most of the singlet excitons, which need at least 0.07 eV energy and correspond, as part of a donor–acceptor mixture, with charge transfer complexes forming. Several series of devices were made for various concentrations and thicknesses. The results are shown in the graphs for comparison (Figs. 6, 7). The devices were submitted for standardized absorption (normalized to P3HT: PCBM efficiency). The decrease in efficiency caused by an increase in the concentration of the second donor is compatible with the predictions of the theoretical model. However, reducing thickness has no positive effect on solar cell performance. On the other hand, the introduction of the second donor has positively influenced the open circuit voltage Voc (connected with crystallinity, the random copolymer effect surface energy, which are correlated with the properties of the polymers). For each concentration and thickness, we have seen an improvement over P3HT: PCBM device. Higher open circuit voltage was observed by Wang et al. (Fig. 8). The results show that this kind of active layer requires simultaneously improving the short circuit current and open circuit voltage (e.g., by nanoparticles dopping). The possibility of using the substance as an acceptor should also be considered. Based on the MPTM-IPQ absorption spectra, it can be assumed that the compounds can act as an acceptor in P3HT: MPTM-IPQ systems. Bulk heterojunction solar cells architecture ITO/PEDOT: PSS/P3HT + MPTM-IPQ/Aluminum was performed. For all three substances the efficiency of the cell was under 1%. The spectroscopic ellipsometry , (Woollam Spectroscopic Ellipsometry M-2000) method has been performed. This was done to determine the refractive index and extinction coefficient of MPTM-IPQ, as well as thickness and roughness of layers in heterojunction solar cells. To obtain coefficients for MPTM-IPQ compounds measurements were made for angles (60°, 65°, 70°, 75°) and wavelength range 300–1800 nm on a corning glass substrate. The ellipsometry spectrum and parameters for PCBM and P3HT are known from Campoy-Quiles et al. . Tauc-Lorentz model [33, 34] was matched to ellipsometric parameters: Ψ—amplitude ratio and Δ—phase difference between p- and s- polarized light waves (p-polarized light has an electric field polarized parallel to the plane of incidence, while s-polarized light is perpendicular to this plane). The modeling process was done using software CompleteEASE™. The dispersion of refractive indexes and extinction coefficient dependence are presented below (Fig. 9). The roughness of the layers, in the case of ellipsometry, applies to the ITO / PEDOT system: PSS/ternary blend/Al cell morphology. The ellipsometric model of the sample does not calculate the parameters of the surface but an effective roughness layer is added to the model. The smoothness of the cell is undoubtedly affected by the PEDOT: PSS layer which when used, apart from supporting the charge transport, is a smoothing ITO surface. The roughness for ITO/PEDOT: PSS/PCBM: P3HT/Al was obtained and it was 20 nm. The roughness for subsequent ternary bulk heterojunctions, with MPTM-IPQ1, was 16.0 nm for an admixture of 5%; 7.6 nm for 10% and 4.4 nm for 15%. Mixtures with MPTM-IPQ2 have a roughness of 20.0 nm, 19.0 nm, 11.6 nm respectively, and for the mixture of MPTM-IPQ2: P3HT: PCBM, 3.7 nm, 3.4 nm and 2.9 nm, respectively. The ellipsometric study showed a decrease of the roughness of the active layers with an increase in the MPTM-IPQ concentration—this result is consistent with Cha et al. In addition, the demonstrated relationship is consistent with the increase in Voc as shown in the previous paragraph by Hörmann et al. . The atomic force microscope research was conducted as the second part of the surface study. The measurements were carried out on a Bruker microscope, MultiMode VIII in the TappingMode mode, using silicon blades subsidized with antimony, with a nominal diameter of 8 nm, a constant lever force of 40 N/m and a resonance frequency of 300 kHz. The image sequence is shown in Fig. 10. Based on the images; self-organization at the polymer/fullerene interface can be observed. The surface parameters are collected in Table 2. Ra is referred to as the arithmetic mean roughness and Rq as root mean squared. It should be noted that the parameters of individual layers do not exceed 1 nm. The behavior of doped methoxyphenyl indenopyrazoloquinoline derivatives is consistent with the results obtained for triazoloquinoxaline . The most efficient weight proportion for the solar cell active layer with methoxyphenyl indenopyrazoloquinoline derivatives has been calculated and investigated. Due to the relatively narrow window of absorption of organic materials, the search for new solutions is particularly important. Open current voltage improvement and roughness of the layer reduction was observed. In the authors’ opinion, previous research  mixing methoxyphenyl indenopyrazoloquinoline derivatives, P3HT and fullerene derivatives in blend film, improves nanomorphology as smaller domain sizes are observed. The active layer mixture can be considered as a guest (P3HT and PCBM)/host (MPTM-IPQ) system.